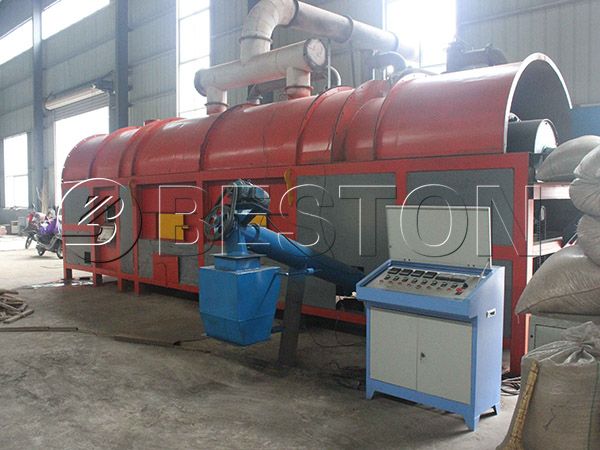 Beston biomass carbonization plant can provide you with valuable energy resources obtained from biomass waste materials like coconut shell, wood, straw, rice husk, sugarcane bagasse, olive shell and so on. It can also convert sewage sludge and municipal solid waste into carbon by employing biomass carbonization technology. 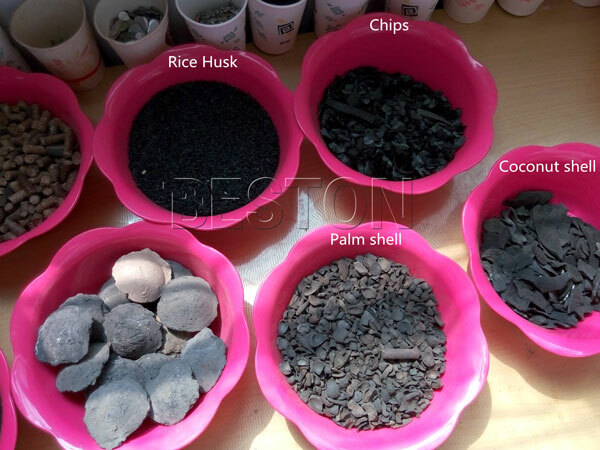 Through Beston carbonization process, we can get artificial charcoal with wood vinegar and tar. It is also a great way to solve the energy resource shortage problem. So far, our biomass carbonization plants have been successfully launched in many countries, such as Malaysia, Netherlands, Turkey, Uzbekistan, etc. Initially, the raw materials need to undergo pre-treatment process if it is not up to the standard. Its size should be around 50 mm with the water content of about 20% and below. We can equip the plant with crusher or dryer in case of pre-treatment process. Then, transfer the processed raw material to silo belt conveyor by the forklift. For conveying the raw material to charcoal carbonization furnace in even speed you just need to move it to the quantitative feeder. This will fully carbonize the biomass waste. The combustible gas will be purified with the help of cyclone dust remover or spray dust collector and enters into the condensation analyzer system. By this process, the wood vinegar and tar get precipitated and thus it can be separated and collected. After then, by using draught fan the combustible gas can be used for heating carbonization host. High-temperature exhaust gas obtained after combustion can possibly be the heat source for drying the heating system. Finally, after the cooling system, biomass charcoal will be discharged automatically. Here is a working video of Beston biomass carbonization plant in Uzbekistan. It can lower the combustible rate about 95% and saves about 80% of the land area when compared to the landfill method. 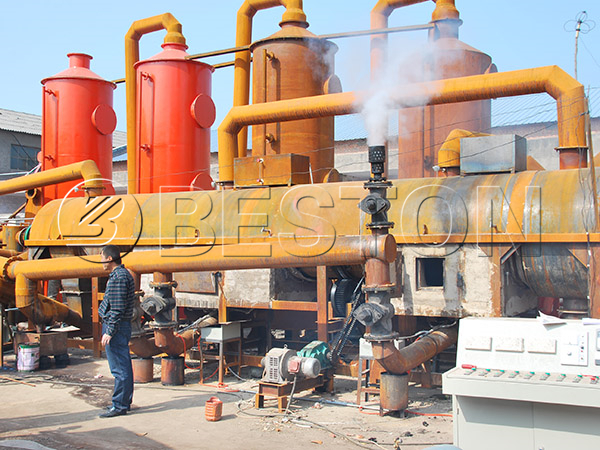 Various models of biomass charcoal machines are existing such as BST-05, BST-10, BST-20, and BST-30. You can choose based on the amount of waste you need to carbonize. Similarly, our biomass carbonization machine available consists of carbonization stove, auto-feeding conveyor, discharging conveyor and dust removal device with other parts. In addition, the highest degree of automation can reduce energy and labor cost. 1. The plant is capable of handling and processing various materials such as rice husk, coconut shell, and municipal solid waste and so on. 2. It is really safe to operate. The security system is quite impressive and safeguards the operators and machines with 100 percent assurance. 3. It is eco-friendly in nature since its dust removal system reduces the harm to the environment. 4. It is basically energy-saving resource. Combustible gas produced can replace the LPG fuel and heats the charcoal carbonization stove when the volume is huge. The carbonization of biomass is safe and eco-friendly. In addition, using the plant is also profitable because of the usages of end products. 1. Biochar generated can be the fuel which will not cause any air pollution. 2. Biomass charcoal has high carbon content than a common charcoal, hence it can be sold as a fuel in the market. 3. You can mill the biochar to charcoal powder and sell it to the international market. 4. This kind of charcoal is the best material to process activated carbon. 5. You can also employ biomass charcoal for making bricks. 6. 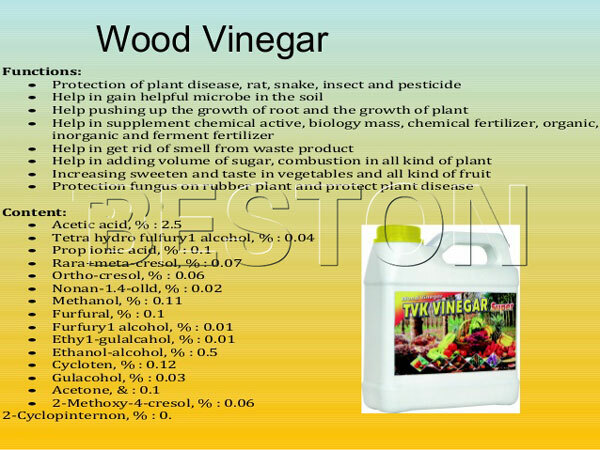 Wood vinegar is the valuable product in gardening and agriculture since it is possessed with antiseptic qualities. Also, it’s an effective chemical pesticide. 7. The wood tar can be used as foaming agent, anti-aggregation agent and asphalt after processing. It is also useful in fields like medicine, synthetic rubber and metallurgy. There are biomass carbonization plants for sale in the market, and if you choose our plant, you will enjoy the first-class provided by us. First, before you buy the plant, you can have an on-the-spot investigation, which means that you can come to visit our factory, and know the whole working process of the plant. Second, after you buy the plant, we will deliver the products as soon as possible. Third, as for the installing, we will send the professional engineer to help you in installing and running the biomass carbonization machine to make sure that the plant can work well. Fourth, you can also enjoy a periodical call visit, so we can get the timely feedback, and we can help you fix the problem if something happens. 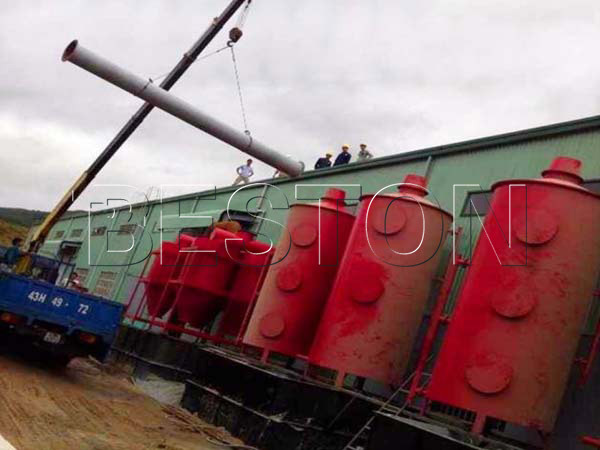 Beston biomass carbonization plant has fixed its dominant status in the international market with its lower energy consumption, affordable price, and best after-sales service and super performance. If you still have any doubt, you can contact us. We are ready to fetch you with solutions.